The two species of skunk are found in California, the striped skunk, which is the most commonly found species, and the spotted skunk. They are both in the weasel family and both have a powerful protective scent gland that can produce a powerful and pungent liquid that can cause nausea and temporary blindness if it enters the eyes. The striped skunk is as large as a house cat, with a white stripe down its back. 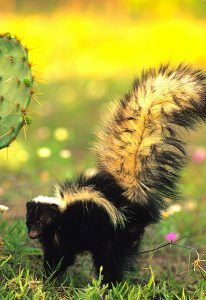 Spotted skunks are smaller with white spots or streaks. Breeding usually starts around February and March for the striped skunk; gestation time is about 9 weeks and litters range from four to six kits. After a few months the kits can be seen following their mother as she makes her nightly rounds in search of food. Skunks often den in burrows, but in urban settings, they den under decks, porches, or beneath buildings. 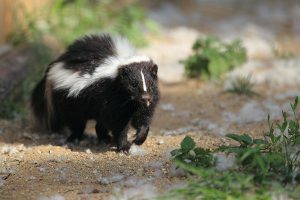 There is cause for concern when skunks take up residence in an urban or suburban area because in California they are primary carriers of rabies, a viral disease transmitted by the bite of an infected animal. Skunks are also carriers of other diseases including leptospirosis, listeriosis, canine distemper, canine hepatitis, Q-fever, tularemia, and trypanosoma. Skunks are attracted to residential areas by the availability of food, water, and shelter. They become a nuisance when they live under porches, decks, garden tool sheds, or homes. They like to feed on ripening berries and fallen fruit and cause many other garden problems by digging while in search of grubs and other insects. They often search for food in lawns by digging small pits or cone-shaped depressions that range from to 3 to 5 inches across. Fish and Game regulations prohibit the relocation of skunks and other wildlife without written permission of the Department of Fish and Game. The prevalence of rabies in the skunk population is one of several major reasons for denying relocation. Recognizing skunk activity is the first step. Possibly barking dogs, or detecting a faint smell of a skunk.Modifying habitat is a good first step. Cutting back vegetation, reducing food sources from falling fruit from trees, and removing outdoor pet food in the evening. The best solution for skunk control is to identify openings under buildings and porches and block them off. Possible entrances under homes, porches, decks, and sheds should be screened with a 1/4” galvanized hardware cloth. Skunks will try hard to get back in so make sure that the mesh is well secured. If there is dirt underneath the entrances make sure to bury the wire 6 inches or more. If the skunks have made their burrow under a building the animals must first be removed or evicted from the space, before the exclusion can be done. Typical methods of skunk control are Skunk Trapping, or the use of one-way doors to allow the skunks to leave but not reenter. Individuals who have no experience trapping skunks should hire a professional wildlife control operator. Professionals have the experience and all the necessary equipment to trap and dispatch the animal. An experienced trapper is also much less apt to be sprayed, an event to be avoided if at all possible. Skunks cannot be relocated without a permit. 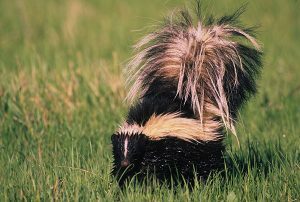 If your dog or cat has confronted a skunk, call your veterinarian to determine current recommendations for washing the animal to get rid of skunk odor. Rabies, an infectious disease caused by a virus organism, is found in the saliva of infected animals. It affects only mammals and is transmitted most commonly by a bite. With the exception of bats, the disease is almost always fatal. People can survive the bite of a rabid animal, but only if medical attention is received in time. A physician should attend to ALL skunk bites, no matter how minor, and the local health department should be notified of the incident.Skunks that seem tame or listless and wander about during daylight hours should be treated with great caution because this behavior is symptomatic of rabies. Also, if they exhibit no fear of people or pets and show some aggressive behavior, chances are quite high that they are rabid. If you live in an area where skunks occur, be sure your dogs and cats are routinely vaccinated against rabies. Some dogs will confront skunks whenever they get an opportunity. Even though they suffer when they get sprayed, some dogs never learn. Contact Wildlife Removal Services for all of your skunk control / prevention needs. We specialize in skunk removal, skunk eviction, and skunk exclusion repairs. We follow all state and federal laws regarding the control and prevention of skunks on your home or business.